John had always wanted to race cars, but family life and financial obligations kept him from it. When he hit his mid forties and the kids were almost raised he bought a sports car “kit” and assembled it. From that point on, his summer weekends were spent racing around the local racetrack. He said he felt free when he was racing in his sporty race car. They said he was rounding the curve on the track and was giving his buddies the thumbs up as he was taking the curve. He missed the curve and flew over the side of the track and off the edge of the cliff. 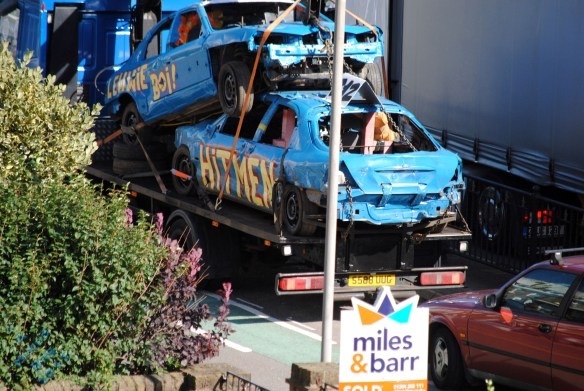 That put an end to John's racing. John was a great guy. I and many others really miss him. But, at least he died doing what he loved. 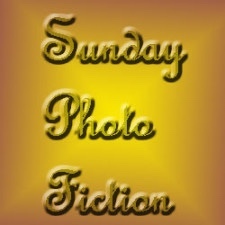 Thank you to Alistair Forbes for hosting Sunday Photo Fiction. This flash fliction challenge is open for all who would like to participate. For more information, please click here. Yes it is. Something tells me he was very peaceful when he died. Now when I hear thunder I will think of him. Thank you for that. Thank you for reading and commenting Al. That is so sad….especially since it is about a real person and was seen by probably his family and his friends. One good thing… he fulfilled his life’s passion and was happy when he past. Yes, it was and is sad. But he was doing something he really loved and I cannot help but think he was very peaceful when he passed. I have to agree with the others – to die doing something you love would be one of the better ways to go if you must. Touching story – thanks for sharing it. Aww.. But it is also the best way to go. I heard a similar real-life story about an old woman who collapsed after she finished her first marathon. She died with a big grin on her face. What a beautiful story. It’s sad but at the same I think John is happy. Atleast he lived out his dream. Yes, he did! I think he died happy. A beautiful tribute. May John rest in peace. Ohh no! This is sad and comforting at the same time. Yes, comforting that he was doing something he loved doing. So glad that you shared it 🙂 As everybody else has already mentioned,, it is probably for the best that he was doing what he loved when he died. Sadly, yes. He was doing something he loved. Dying while doing something we love. Cant we ask for more? 🙂 Nice tribute! Great story, but wish it wasn’t true! Tho yes at l;east he died happy! Its wonderful that he got to live his dream! But can’t imagine his friends and family watching him go over the cliff!! His family wasn’t there, just some of his friends. But still, it’s sad. That caught me off guard Priceless! My sympathies to those who loved John. Thank you Colleen! He was a great guy! Well- and succinctly written and conveyed…sorry to hear about it being true. Best to have passed in a leisure activity than anywhere else! Good lesson and I’m glad other readers saw that too! Thank you Terri! He really was a great guy and I am comforted that he passed away with his thumb up having the time of his life! Now, if only others would learn from this, that would be great. RIP…. So glad that he was doing what he loved. I hope for all of us the same pleasure as an end! Oh goodness! A true story… how sad. His poor family. Yes, his poor family. It was very sad. Whew, that must’ve been tough to write. Sorry for his family’s loss. He was a great guy and it was very sad, for his family and for his friends. If you have to go early, then go doing something you love. It somehow numbs the pain felt by those left behind. Rosey, you are right about that! He was doing something he loved. I am glad he found a passion and enjoyed his life. So sorry for all your loss of family and friend. Thank you Donna. It was a great loss to his family and his friends. Thank you for reading and for your comment. While this song was about teens… it was also about passion and loss. I can only imagine what my FIL might have been thinking as he never really did speak much of his time in the service of WWII. Wow i was shocked it was true! Just when I thought it was going to end on a high. Sad story. Going out doing what you love is best you can hope for. Yes, that is true. Dying do what we love is the best we can hope for.